Cars Go Zoom! – Sunshine. Whimsy. Tacos. 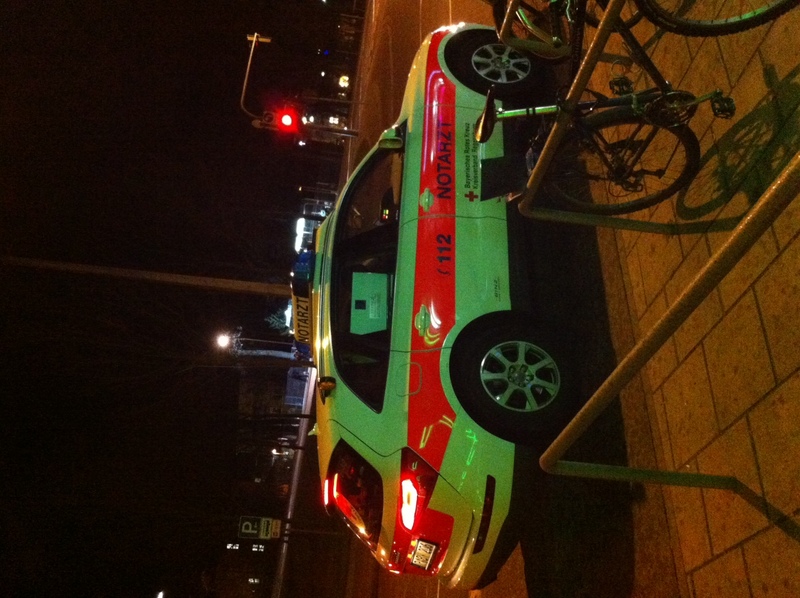 When I got to Germany back in November, I had a ride from the Munich airport to my hotel here in Regensburg. Along the way, though, I got to see the Autobahn for the first time, and I got to see the German countryside for the first time. Neither was even remotely what I expected. The countryside was decidedly more rural than I thought it would be. I didn’t realize before coming here just how much agricultural business goes on in Germany. Outside of the main city areas, it’s pretty much all farmland or forest, with the occasional village in between. In retrospect, this makes perfect sense: How else could a country brew this much beer if they weren’t also farming a metric buttload of hops for the brewing process? This post isn’t about agriculture though, it’s about cars. While I was on the road between Munich and Regensburg, my eyes were practically glued to the window looking at cars and road signs. Biggest city in Germany. 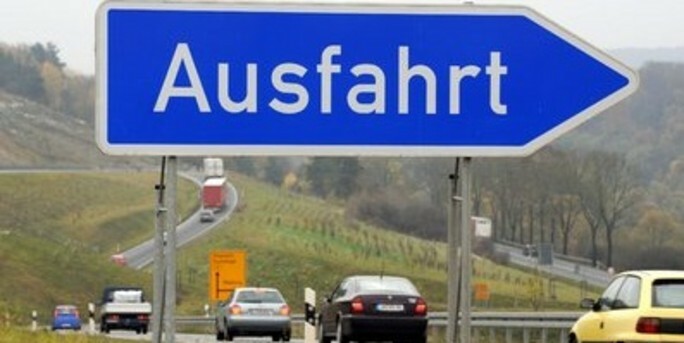 Almost every Autobahn exit directs to it. – Damn, I missed the exit. – Don’t worry. The next one will be to “Ausfahrt” as well. I think I may have seen too many James Bond chase sequences to have a realistic idea of what the Autobahn would look like, though. I expected it to be wide and flat and fast. I didn’t see stretches of the Autobahn that really matched that description until much later, as it turns out. As I hurtled down the Autobahn in the airport liner van on that first day, I watched the cars that were going past us, and the cars we passed. Some things were completely as expected: Lots of BMW and Volkswagen, Mercedes and Audi. Also present, in smaller numbers, were expected vehicles like Fords and Minis, Suzukis and Hondas, Mitsubishis and Toyotas. And one Lamborghini, just to be contrary. I’ve since seen a Tesla Roadster, but that’s not at all common. After observing for a while, I noticed something interesting- nobody here has a huge car. Space is at a premium in all things. Parking lots are small. I haven’t seen anything like a Hummer or a Ford Explorer. I’m sure that larger vehicles might be in use on farms, but not in the cities. With gas prices currently running at the equivalent of eight and a half US Dollars per gallon even for the cheap stuff, this isn’t really a surprise. It’s priced per liter here, but after you convert liters to gallons, and Euros to dollars, it’s not cheap. I saw a Pontiac Trans Am purring down the street last week, and I thought I was hallucinating. Over the last few weeks, I’ve been building up a little collection of pictures of official vehicles, because they fascinate me. In the US, most of the official vehicles are common American brands, and that’s to be expected. Here, though, there is an entry level Mercedes that looks like it’s roughly the right class to compete with the Honda Fit. In the US, Mercedes is a luxury car. 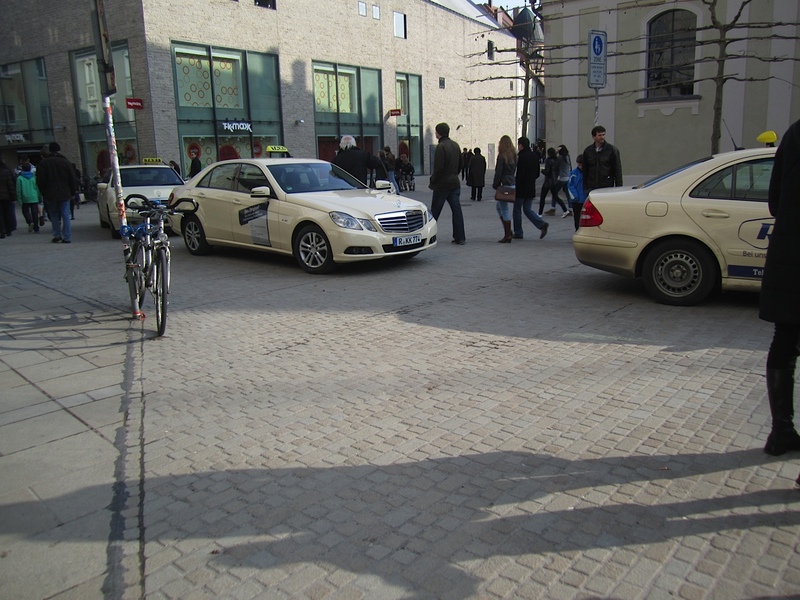 Here, all of the taxis are Mercedes. The same thing applies to emergency vehicles. Ambulances and fire trucks are pretty much what you’d expect- a van is a van is a van- the smaller emergency vehicles, however, are pretty snazzy looking. the fire department’s smaller vehicle? BMW. 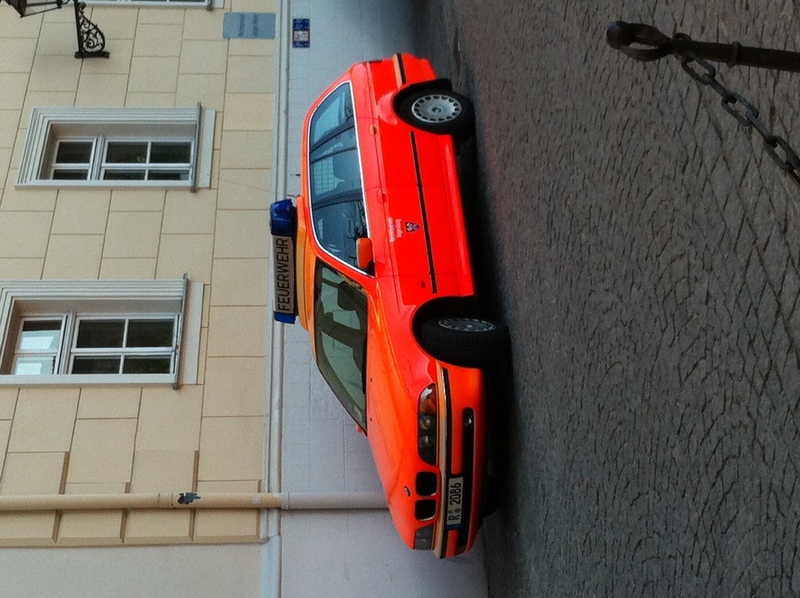 Last, but certaintly not least, are the Polizei. (And bonus, it’s next to a Skoda in traffic, so you can see one of those as well.) Our frendly neighborhood cops drive BMWs accented with green. I’ve been told by several people that the police are shifting gradually over to blue instead of green to match large portions of the rest of the world, but I haven’t seen any blue on the cars or uniforms yet around town. 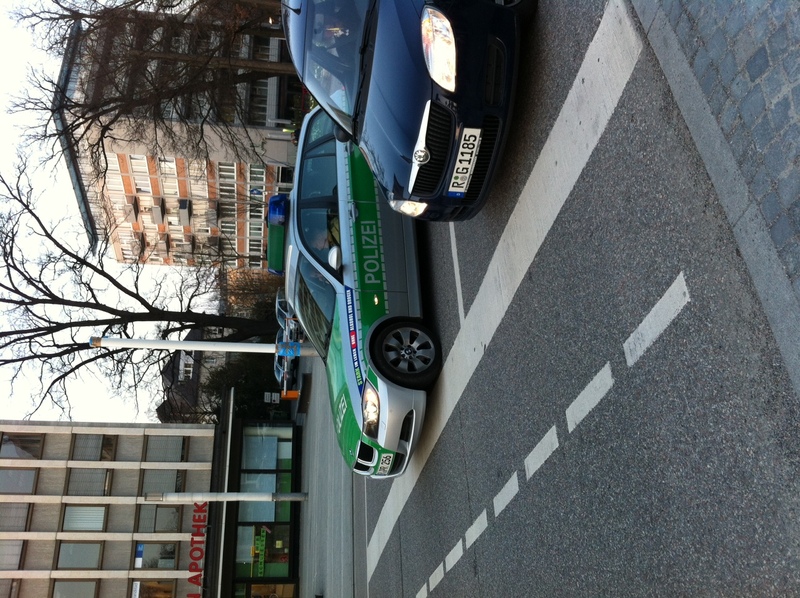 I happen to think these little hatchback polizei cars are pretty good looking, though. I wanted an Audi before I moved to Germany. I wonder if I’ll still want one as badly when I get back to the US. I’ve since seen a Tesla Roadster, but that’s not at all common. I saw one yesterday, orange, on my way home from work! It was parked on the north side of Adolf-Schmetzer-Straße, east of Weißenburgstraße (and try giving directions like that to your colleagues if you want to see their eyes roll back in their heads). Same one you saw? I frequently see one parked at work. It catches your eye because it’s so tall, but it also looks like someone blinged it out with extra chrome detailing. And it’s got a URL on a sticker on the back. Maybe it’s for hire, though I don’t think I could afford the gas! No, not the same Tesla! The one I saw was green, and it was present at an alternate energy expo next to the Conrad a few weekends back. There were various electric vehicles, a couple of Segways, a battery powered skateboard, and a bunch of other electric vehicles. I took lots of pictures because that’s how I roll.